When you are on the overview page of the collections you can do several things. Create a new collection by clicking on the New collection button. Copy an existing collection by clicking on the Copy a collection button. 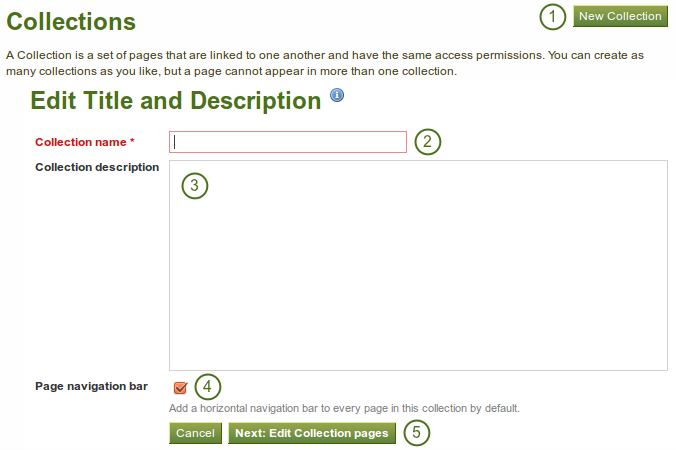 Click on the Manage button to move pages within a collection, add to or delete pages from a collection. Click on the Edit button to change the title and description of a collection. Click on the Delete button to delete the collection. The pages will still exist. Click the New collection button under Portfolio → Collections. Collection title: On the next screen, provide a title for your collection. Collection description: Optionally, you can also write a short description about your collection. You do not have a visual editor, but just a plain text box. Page navigation: Choose whether you wish to display a tabbed navigation or not. If you choose not to, you will have to include the navigation block for you to go from one page to the next. Click the Next: Edit collection pages button. Click the Copy a collection button under Portfolio → Collections. Search owners: Search for the author of the collection. Collection title: Click on the title of the collection to see a preview of it before you copy it. Click the Copy collection button to copy the collection into your own portfolio. Edit the collection and its pages as you would do any other collection or page. 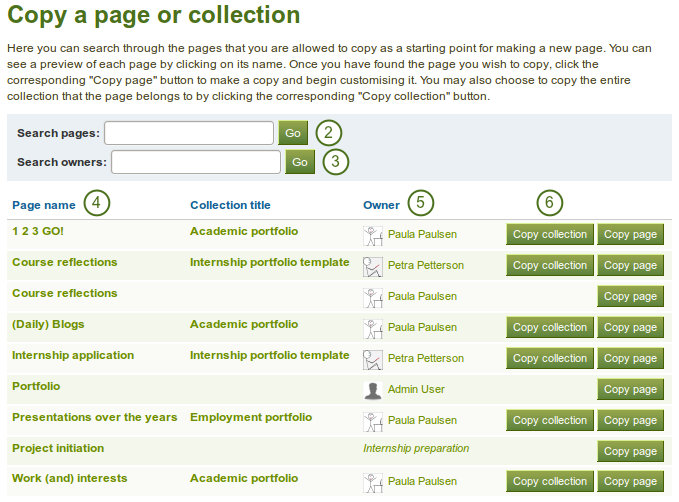 In the next step after you have created your collection, you choose which portfolio pages you wish to include in this collection. You see all the pages that you can use potentially. If you had already placed a page into another collection, it is not an option here. You can add more pages to a collection from the Add pages to collection box.